Tobacco or other substances, in a thin roll wrapped with paper, intended to be smoked. He rose to light my cigarette, then sank back into his wicker chair contentedly. The tea was weak, but not cold, thanks to the hot-plate. Grandma has an occasional cigarette, as well as Uncle Jimmy and Aunt Julie, and our kids give them crap about it. 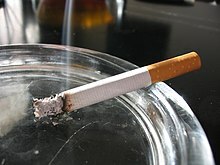 (slang, rare) To give someone a cigarette, and/or to light one for them. “cigarette” in le Trésor de la langue française informatisé (The Digitized Treasury of the French Language).